In this tutorial, we will cover the installation of Nagios 4, a very popular open source monitoring system, on CentOS 7 or RHEL 7. We will cover some basic configuration, so you will be able to monitor host resources via the web interface. We will also utilize the Nagios Remote Plugin Executor (NRPE), that will be installed as an agent on remote hosts, to monitor their local resources. Nagios is useful for keeping an inventory of your servers, and making sure your critical services are up and running. Using a monitoring system, like Nagios, is an essential tool for any production server environment. To follow this tutorial, you must have superuser privileges on the CentOS 7 server that will run Nagios. Ideally, you will be using a non-root user with superuser privileges. A LAMP stack is also required. Follow this tutorial if you need to set that up: How To Install LAMP stack On CentOS 7. This tutorial assumes that your server has private networking enabled. If it doesn’t, just replace all the references to private IP addresses with public IP addresses. Now that we have the prerequisites sorted out, let’s move on to getting Nagios 4 installed. This section will cover how to install Nagios 4 on your monitoring server. You only need to complete this section once. Because we are building Nagios Core from source, we must install a few development libraries that will allow us to complete the build. Download the source code for the latest stable release of Nagios Core. Go to the Nagios downloads page, and click the Skip to download link below the form. Copy the link address for the latest stable release so you can download it to your Nagios server. Find the latest release of Nagios Plugins here: Nagios Plugins Download. Copy the link address for the latest version, and copy the link address so you can download it to your Nagios server. Find the source code for the latest stable release of NRPE at the NRPE downloads page. Download the latest version to your Nagios server. Save and exit. Only the Nagios server will be allowed to communicate with NRPE. Now that Nagios 4 is installed, we need to configure it. Now let’s perform the initial Nagios configuration. You only need to perform this section once, on your Nagios server. Save and exit. This allows you to use the check_nrpe command in your Nagios service definitions. Enter a password at the prompt. 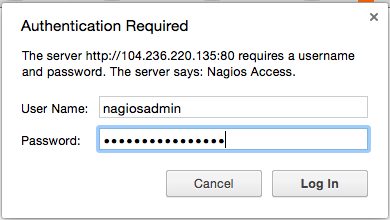 Remember this login, as you will need it to access the Nagios web interface. Note: If you create a user that is not named "nagiosadmin", you will need to edit /usr/local/nagios/etc/cgi.cfg and change all the "nagiosadmin" references to the user you created. As these lines will appear twice in the configuration file, so you will need to perform these steps once more. Nagios is now running, so let's try and log in. As you can see, Nagios is monitoring only "localhost", or itself. Let's monitor another host with Nagios! In this section, we'll show you how to add a new host to Nagios, so it will be monitored. Repeat this section for each CentOS or RHEL server you wish to monitor. Note: If you want to monitor an Ubuntu or Debian server, follow the instructions in this link: Monitor an Ubuntu Host with NRPE. Save and exit. This configures NRPE to accept requests from your Nagios server, via its private IP address. Once you are done installing and configuring NRPE on the hosts that you want to monitor, you will have to add these hosts to your Nagios server configuration before it will start monitoring them. With the configuration file above, Nagios will only monitor if the host is up or down. If this is sufficient for you, save and exit then restart Nagios. If you want to monitor particular services, read on. If you're not sure what use generic-service means, it is simply inheriting the values of a service template called "generic-service" that is defined by default. Now that you monitoring your hosts and some of their services, you might want to spend some time to figure out which services are critical to you, so you can start monitoring those. You may also want to set up notifications so, for example, you receive an email when your disk utilization reaches a warning or critical threshold or your main website is down, so you can resolve the situation promptly or before a problem even occurs. To configure your Centos server with LAMP (Linux, Apache, MySQL and PHP) and other required packages on your server.